Party Girl diet™ author Aprilanne Hurley shares a special note of thanks to Hawaii News Now Sunrise & Host Steve Uyehara for a fun morning on the set. Hawaii News Now Sunrise co-host Steve Uyehara was first to taste Party Girl Diet’s Skinny Fudge with an Aloha Diet Mac-Nut twist. One of Party Girl Diet author Aprilanne Hurley’s first Hawaiian TV News appearances was on KGMB – KHNL’s Hawaii New Now Sunrise - “Hawaii’s #1 Morning News Show,” where Hurley had the pleasure of meeting Sunrise Co-Host Steve Uyehara. 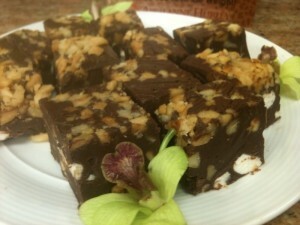 Hurley prepared a fun, healthy array of Hawaiian inspired Party Girl Diet™ food and drink ideas for the Uyehara and the Sunrise audience, including the Party Girl Diet’s famous No-Bake “Skinny Fudge,” which was made with a simple and delicious Hawaiian twist: Adding roasted Hawaiian Macadamia nuts. 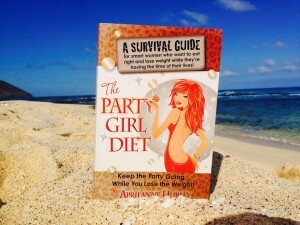 Party Girl Diet author Aprilanne Hurley makes her mark on Niihau – Hawaii’s “Forbidden Island” on the Party Girl’s Aloha Diet Discovery Tour. While extensive travel features are in the works for all of the Hawaiian Islands Hurley visited, it was the remote island of Molokai, one of Hawaii’s least visited islands that became the grand finale Hawaiian Island visited on Hurley’s Party Girl’s ‘Aloha Diet’ Discovery Tour. Party Girl Diet™ author Aprilanne Hurley gets a rare look at Molokai – Hawaii’s “Most Hawaiian Island” on the Party Girl’s Aloha Diet Discovery Tour. 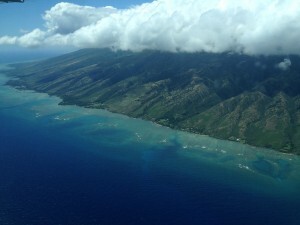 In addition to touring Molokai’s vast beauty, and rich spiritual history, including Father Damien’s saintly mission to help the lepers (more on this to come), Hurley learned the traditional Macadamia nut harvesting and roasting methods that have earned Hawaii the distinction of producing the most delicious Macadamia nuts in the world. In addition to their amazingly rich taste and toasty texture, Macadamia nuts are considered the healthiest nut in the world. You can read Party Girl Diet™ author Aprilanne Hurley’s report on the amazing health benefits of Macadamia nuts on Examiner here. Aloha Diet’ “So Ono Mac-Nut Skinny Fudge” is a rich, sweet treat kissed by the golden buttery flavor and distinctive crunch of Hawaiian Macadamia nuts. Line an 8 X 8 baking tin with wax paper or cling wrap. his is an important step as the fudge will stick to the sides and bottom of the pan and will not come out smoothly without a fight otherwise. Combine chocolate chips, fat free sweetened condensed milk, and salt in a heavy saucepan, and cook over low heat until chips are completely melted, stirring frequently. Remove from heat, and stir in vanilla and half of the Macadamia nuts, and optional mini-marshmallows. Sprinkle the remaining half of the Macadamia nuts evenly on bottom of lined pan. (These nuts will become the top of the fudge when finished). Spread the melted chocolate mixture evenly over Macadamia nuts in wax paper lined 8 or 9- inch square pan. You can also use saran wrap’s “cling” wrap, which is what we used to make the fudge in the photo to the right. Turn fudge pan upside down onto cutting board, and peel off the wax paper. Cut into squares, and arrange on a party dish, or in a gift box for giving. Store leftovers covered in the refrigerator. You can have all of the ingredients to make this fudge recipe in at all times so you can whip up a batch of delicious Aloha Diet Mac-Nut-Skinny Fudge to bring along to those last minute party invites as a yummy hostess gift everyone will love. Party Girl Diet™ Entertaining Tip: Craft stores sell plain white candy boxes that can be personalized with a special sticker or fancy ribbon, which will add an elegant touch to your gift for giving. The Party Girl’s Aloha Diet™ Mac-Nut Skinny Fudge – while lower in fat and containing dark chocolate that offers health benefits from the flavonols, does contain fat and sugar and should be considered a “treat” in a healthy diet plan.